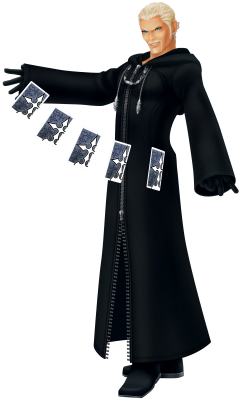 Luxord is a member of the original Organization XIII and a current member of the “true” organization. Luxord is depicted as being very sophisticated, using a large vocabulary and possessing a clear british accent. He also exudes an certain amount of arrogance and greatly enjoys gambling. In battle he wields a deck of massive cards which he uses to great effect when paired with his power over the element of time. During the events of Kingdom Hearts 358/2 Days and Kingdom Hearts II, Luxord was a nobody, created when he lost his heart to darkness at an unknown time and place. He was ranked number 10 in the organization. While it is to be assumed that in Kingdom Hearts III he has returned to human form once again, his real name remains a mystery.